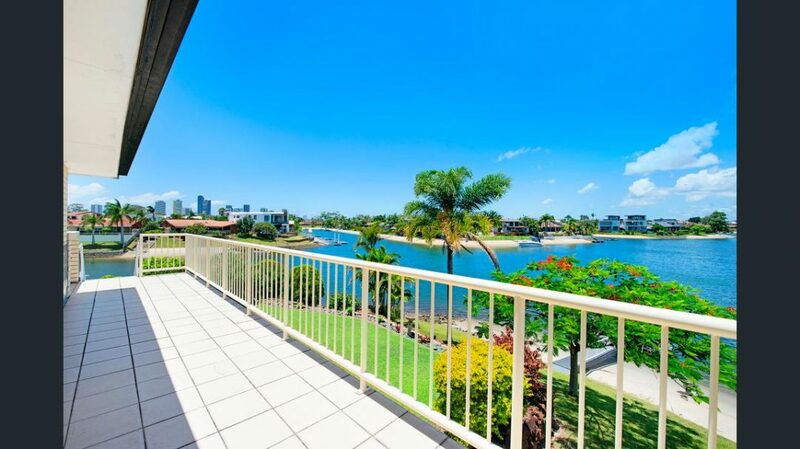 Explore the endless potential on offer with this spacious 4 bedroom, 2 bathroom 2-storey property in popular Broadbeach Waters. Ripe for renovation, and set out on a 1176m2 point position, waterfront block, it’s currently set up for an enticing dual living opportunity and boasts excellent bones to build upon. You’ll be able to take full advantage of the spectacular skyline and wide water views and create a magnificent waterfront masterpiece you’ll be proud to call your next home. The existing floorplan boasts ample room upstairs with the fully self-contained 1 bedroom, 1 bathroom flat which also features a lovingly looked after kitchen, study nook and living area. It’s flanked by balcony’s which promise impressive water and skyline views on one side and soothing hinterland vistas on the other. Downstairs delivers 3 more bedrooms, a full family bathroom, laundry, double garage plus secure off-street parking for 4 or more vehicles. The kitchen is a comfortable size, while a generous living area with wet bar is set against the backdrop of panoramic water views. Outdoors, you’ll enjoy the lush tropical gardens, a vast 32m of sandy beachfront, alfresco entertaining area, timber jetty, as well as a sparkling pool and spa nestled in the front courtyard. Perfectly positioned, with easy access to all the vibrant offerings of Broadbeach, including famous beaches, cafes, restaurants and offering excellent proximity to Star Casino and Pacific Fair, private and public schools and all necessary amenities, this is an enviable location which will spoil you for anything else. Released to the market for the first time in 36 years, this is an investment sure to deliver the discerning developer, investor or renovator a dream residence and luxury lifestyle. Do not delay, arrange your inspection with Jamie Harrison today. *Disclaimer: This property is being sold by auction or without a price and therefore a price guide cannot be provided. The website may have filtered the property into a price bracket for website functionality purposes.